Corbin Streets. When the officers attempted to detain him, he fled, and officers engaged in a foot pursuit. 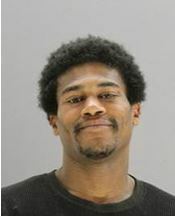 The suspect was taken into custody and identified as Cruise Kristeo Smith, B/M/31. Smith was charged with Evading Detention/Arrest, as well as Possession of a Controlled Substance. He was transported to Police Headquarters and interviewed by Detectives. Smith is currently in the Lew Sterrett Jail charged with Evading Detention/Arrest, Possession of Controlled Substance and Aggravated Robbery. His bond has been set at $25,000. On Tuesday, February 13, 2018, at about 9:40 p.m., the victim was walking in the 1800 block of Laws Street near the West End when she was punched in the face and knocked down to the ground by two unknown suspects. The suspects took off some of victim’s clothing looking for property as she lay in the street unconscious. The suspects fled with the victim’s property when a vehicle approached. The suspects ran toward Griffin Street. This offense is documented on case number 032510-2018. If anyone knows the identity of the suspects involved in this offense, please contact Detective Holmes at 214-671-3637.